I’ve gotten used to living with an Aurora Hunter. The constant monitoring of atmospheric indicators. The blips and beeps that go off night and day from apps informing him of favorable conditions. Flinging around mysterious terms like Kp index, solar wind speed, Bz and coronal mass ejection. And the nocturnal trips out into the dark and cold. All in search of Northern Lights. It’s a lot like going to estate sales. The ads sound really good, and you’re sure you’re going to find some real treasures. But the reality is many of the sales are duds with nothing of interest. Then just when you think you can’t stand to walk through one more crowded house crammed with odd stuff, you hit a gem – a true winner. And all those fruitless trips were worth it just for this one. I’ve gotten good at sleeping through most of this. So good that two nights ago I had no idea that Rich’s alerts went off around 2:00am, pulling him out of bed and out into the night. It wasn’t until shortly after my alarm went off at 6:00am that I heard him – returning. And this time he was victorious. “Oh Wow” were the first words out of his mouth. The rays were dancing around the sky and he could even see the reds with his own eyes. Pretty impressive, and I admit to feeling a twinge of envy. To be fair, he did text me with a description and lot of exclamation points, but I slept through that bleep as well. With promises of another night of auroral activity, I suited up in all my long underwear and winter gear to go along this time. The word was to get out early, and it was good advice. After driving an hour to a remote lake with a good view away from any city glow, we could already see faint green spires shooting into the sky even in the fading light of the sunset. 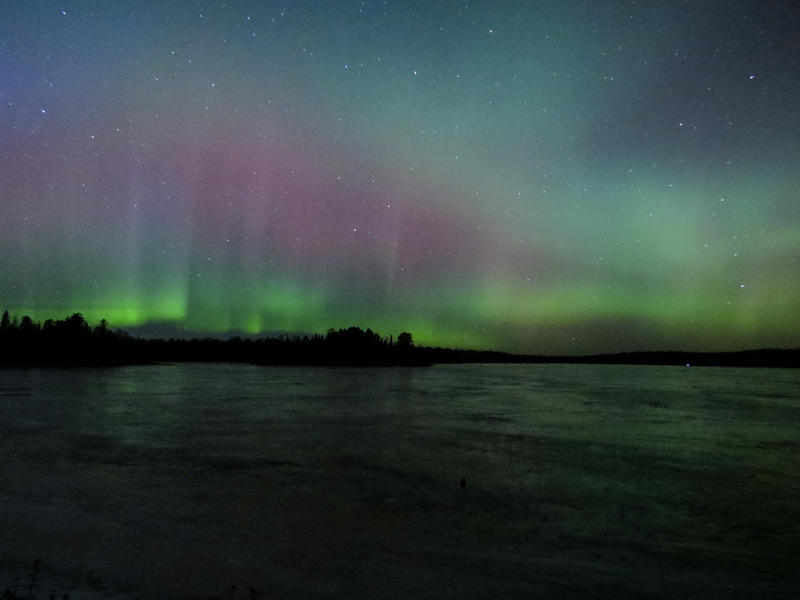 The darker the sky got, the more aurora lights we could see. By 9:30 the lights were emanating from a full semi-circle around us, spreading well up into the sky. The best part was when the most brilliant lights started on the right and unfurled above the horizon. It was easy to see them advance across the sky above the lake, twisting and growing as they illuminated the night. Naturally Rich was out with his camera, his passion being to capture the magic. Thinking I had plenty of time for that later, I merely watched. It was liberating to just take in the lights, to be able to look all around the sky at the various components of the light show and the interplay between the columns of light. Later when it became clear that it was the peak of the display, I wished I had been prepared to photograph it. But then again, I would have missed much of the drama. By the time I did set up my tripod and camera, the lights were dimming. No longer did we have the deep green hues and movement. But it was still beautiful. Shortly after I took a few test shots, the color began to fade. Surprisingly, the resulting photos had some merit. It helps that the camera captures more color than I can see. We lingered for about another hour, but the lights dwindled to a dull white glow. Although the indicators were still quite positive, the reality was that the show had ended. It never did reach the pinnacle that it did the previous night, but that’s the nature of the Northern Lights. Nothing is ever guaranteed. I know enough now that I will probably miss some of those spectacular displays. I just don’t have the persistence to act on every alert. But Rich does, and if I get lucky in choosing when to accompany him I will likely see some pretty good Northern Lights, like last night. Such is the life of an Aurora Hunter’s wife. 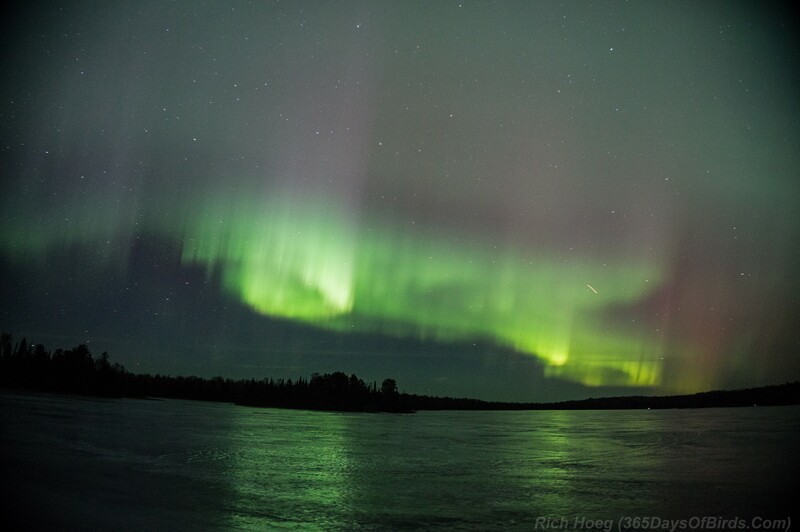 This entry was posted in Outdoors and tagged Aurora Borealis, Northern Lights, Outdoors, Photography by Molly. Bookmark the permalink. It was special to watch the Aurora with you last night. Having the owl hoot away while the lights were unfurling was really cool! Awesome pics ! They are certainly something to witness live.